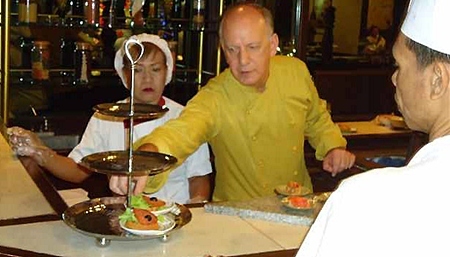 Many years ago, the top man in the kitchens at the Montien was Chef Horst. Well, he’s back after a sojourn in Egypt where he had 25 restaurants to look after and 380 cooks to prepare the food under his supervision. 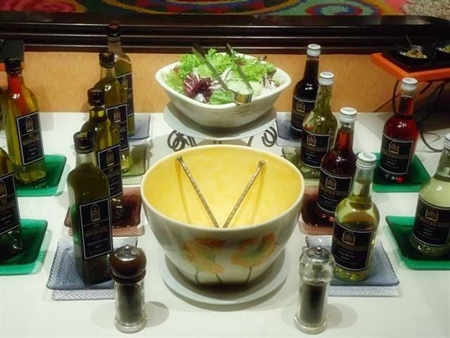 He has revitalized the Mediterranean Buffet and has introduced some Middle Eastern dishes, and rotates the buffet offerings so that the diners do not get tired of the same old items. The La Mer venue inside the Montien is warm and welcoming. The pianist and his lady singer understand that they provide the background, and conversation is easy. 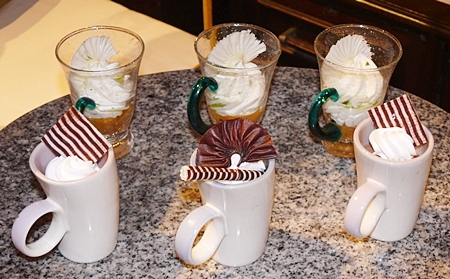 In the center are food warmers with around four portions in each. As soon as they get down, more is cooked and placed in the warmer. The food items are fresh. Along one wall are stations with cheeses and salads and different salad dressings. There is also a tapas station and on our Wednesday evening, one making Moroccan honey pancakes. 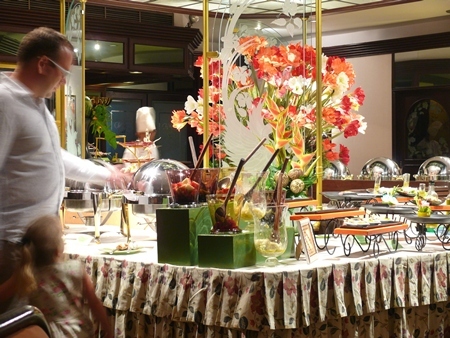 This time the Dining Out team included an eight year old young lady who would tell us what the junior members felt about the buffet, remembering that the Montien does happily cater for children. 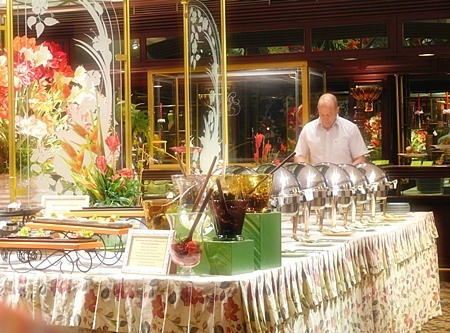 One piece of advice I always give when reviewing buffets, reiterated by Chef Horst, is to take your time. Wander around and make of note of what is on offer. There is nothing worse than stuffing yourself, to later find something you really enjoy, but now have no room! I began with the Tuscany vegetable soup with canellini and borletti which was hot, filled with vegetables, and very flavorsome. For me, a great start to the evening. Hot garlic bread was served at the table, and this just added to the enjoyment. Being rather partial to cheese, I took a slight breather and dwelled on the mixed cheese platter with Mozzarella, Feta, Cheddar and Blue cheese with a home-made herb and garlic cheese and Pesto cheese balls. I ate the cheese with a glass of the Montien’s house white wine, an eminently quaffable drop. When I was ready I returned to the food warmers with their dazzling chrome polished cloches, and in the name of investigative journalism I tried the Lemony chicken scallopine, plus the Italian style beef tenderloin in a beautiful Chianti sauce, some garlic roasted shrimps with Oregano butter crumbs and a roasted fish with Bagna Cauda and Italian peppers. Of those choices, I have to say that whilst they were all excellent, the beef tenderloin, wrapped in bacon and the Chianti sauce came out on top. I was tempted by the spaghetti, but noting that the Junior Taster had claimed this as her own, I returned to the cheese board and finished with a cup of coffee. By the way, don’t forget it is St. Valentine’s Day on February 14, and the Montien’s La Mer can help you entertain your Valentine with a four course set menu with a glass of wine at B. 950++ (with rock lobster Newburg with champagne foam as one of the choices). 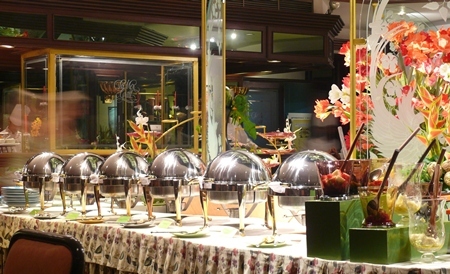 La Mer Wednesday Buffet, Montien Hotel, Pattaya 2 Road (50 meters up from the Central Road (Pattaya Klang) intersection), North Pattaya, telephone 038 428 155 (and I would suggest you book, as it was very busy on our Wednesday evening), email [email protected] Montien.com. Open seven days, 6.30 p.m. until 10 p.m. Secure parking within the hotel grounds.